What Are People Saying About Your Business on the Internet? With the growing importance of the Internet in people’s daily routines and the rapid explosion of social media, businesses simply cannot afford to ignore what people say about them online these days. Wow! 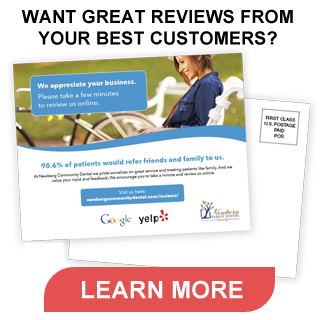 So, by hiring us to help manage and cultivate their online reputation, our client was able to obtain a new patient, worth probably $5,000 over the next 5 to 7 years, just because they have a profile and reviews on Yelp, a social media site that many business owners still aren’t even aware exists! Social proof, or informational social influence, revolves around the psychological phenomenon of how people decide on the appropriate mode of behavior in ambiguous social situations. In a commercial context, examples of such “ambiguous social situations” might include deciding which dentist to visit, which restaurant to patronize tonight or what model of cell phone to purchase. Since people lived in caves, we have always relied on other peoples’ actions and decisions to gauge our own behavior; it’s part of the genetic fiber of humanity that hasn’t changed much in 10- or 20-thousand years. But the Internet and social media are radically changing the means by which people research products and service providers to determine what action to take in making any given purchasing decision. Consider another success story our client, Brett Johnson, DMD recently shared with us: “Last Wednesday I had a new patient in and he was the first one to tell us he found us on a Google search, and since we were #1 in the organics, he chose us.” In fact, Dr. J reports that he is now getting new patients on a regular basis as a result of having greater online exposure than his competitors, whereas 6 months ago, before engaging our services, he had no Website and virtually no online presence. So, what’s the reason Dr. J’s practice holds the number one Google search result for his most important keyword query? Because we’ve helped ensure that he has plenty of social media mentions and positive reviews across a range of popular blogs, Google Places and other social media sites, whereas his competitors most likely haven’t yet realized the importance of investing in proactively managing their online reputations. Most business people believe that word-of-mouth is the single most important means of reaching new customers and growing their businesses. And while this remains true, what is changing very quickly is the way that word-of-mouth marketing actually works. Social media and the Internet give customers and prospective customers powerful tools to collectively discuss businesses’ products and services online. And what’s more, unlike conversations between people at social events, the grocery store or on the street, when somebody says something about your business online, it’s a more-or-less permanent digital record; it’s there for the entire world to see. In today’s hyper-connected world, peer reviews (what customers tell each other about various businesses’ products and services), as well as expert reviews (what authorities on your business niche) have far more importance in consumers’ purchasing decisions than what you say about your own business. Reputation management is about proactively encouraging customers to review your products and services online, leveraging the word-of-mouth marketing potential of positive social media mentions and reviews about your business. It’s also about being on guard and having a plan to handle the inevitable negative reviews and mentions that are bound to affect your business sooner or later. You can try, like the proverbial ostrich hiding its head in the sand, to ignore the social media phenomenon, but really you can’t stop people from talking about your business online anymore than in their own neighborhood, at a ball game or anywhere else! Where Are People Talking About Your Business Online? The social media landscape evolves at light speed. Sites like Facebook and Twitter were virtually unknown 5 years ago. Yelp, Foursquare, Quora, Gowalla and many others may not even be on your radar yet. But today’s early adopters quickly lead the way toward mainstream adoption. How Do You Monitor Your Online Reputation?